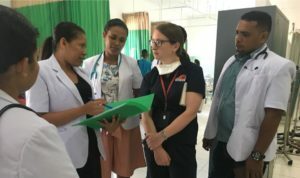 “A 23 year old female was admitted to Klibur Domin with infectious TB, she had been started on treatment a month previously. She had 2 young children, 5 months and 2 years, at home. Young children are at high risk of developing TB, and if they are a contact of a patient with TB they need to be screened for symptoms. They can then be started on preventative therapy if they are asymptomatic or If the child is symptomatic they can be investigated for TB. Her children had not been screened and Maluk Timor asked the mother to bring her children in for review when first meeting her. On arrival the youngest child was very unwell, he had a cough, shortness of breath and high fever. He was malnourished and required urgent medical attention. He was promptly started on TB treatment and started to improve. If he had not been brought in when he was, he could have died. His brother also required TB treatment. 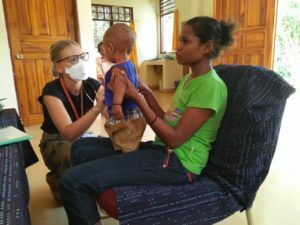 Now the mother and 2 children are back in the community finishing treatment at home, they are feeling well and gained weight. The young boy had died for a completely preventable disease? If a household contact screening visit had been performed when the mother was first diagnosed then he would have had any symptoms picked up earlier and started on treatment? Or if he or his older brother had been asymptomatic they could have received preventive therapy and never developed TB.